Hanover, New Hampshire and Olmstedville, NY, Noelle Sullivan Donahue (88), of Hanover NH, passed away January 1, 2018 in Hanover, NH. Noelle was born in Ticonderoga, NY to Walter and Kathleen (Mea) Sullivan on December 25, 1929. She married James D. Donahue June 7, 1958 in Olmstedville, NY. Prior to her marriage she cared for her mother and worked summers on the Minerva Youth Program. For many years she worked as an aide at Johnsburg Central School, and after moving back to her childhood home in Olmstedville, she worked for the town's assessor and then served as the Minerva Town Historian. 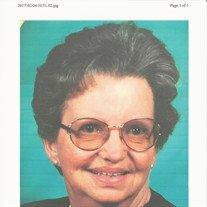 She was an active member of the Minerva Historical Society and Saint Joseph's Catholic Church. One of her many talents was painting and she designed and painted the "Tree of Life" murals in the Minerva Historical Museum. In addition to her parents, Noelle is predeceased by her husband James Donahue, her brother Donald Sullivan and her sister Rita Montgomery. She is survived by her daughter Deborah Edwards of Grantham, NH; her son Daniel Donahue of Nutley, NJ; her grandsons Bradley (Ashley) Edwards of Lewiston Maine and Nicholas Edwards of Boston Mass; two great granddaughters, Charlotte and Mackenzie Edwards, several nieces and nephews and many lifelong friends. A Funeral Mass will be offered by Father F. Philip Allen at 11:00 AM Saturday January 6, 2018 at St. Joseph's Catholic Church in Olmstedville, NY. Interment will take place in St. James Cemetery in North Creek in the spring. Friends may call at the Edward L. Kelly Funeral Home 1019 US Rt. 9 in Schroon Lake, NY Friday from 4:00 until 7:00 PM. The family suggests memorials take the form of donations to the Minerva Historical Society, PO Box 1, Olmstedville, NY 12857.